So I had some free time at the end of this winter and I wanted to do something with those saved up frequent flier miles. So I decided on a vacation to Seattle for some site seeing and a break from the same old same old work schedule I had fallen into. It’s always nice to break up the norm with a little fun throughout the year, and that was my plan. Of course upon arriving I had to find a way of getting around, and it turns out that they have a Hertz right at the airport there. So, using the $25 a day deal on Hertz I rented a Kia Rio as my means of transportation around town. When I was looking at places to stay I kept coming back around to the Four Seasons Hotel. Everywhere I looked it appeared at the top of the list for excellence. So I decided that with the money I saved on my rental car it would be a great place to stay. The best part about the hotel is the view of the water from my balcony. They also had a nice bar and diner, and when I say nice I mean along the lines of gourmet. 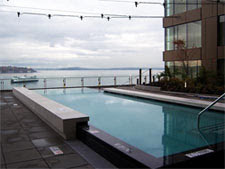 They even had a pool with a beautiful view of Puget Sound, the giant lake/river surrounding the city. One of the things everyone told me I had to absolutely see was the Olympic Sculpture Park. They also told me that the best part about these awesome pieces of art is that it was free. It turns out that the park isn’t this small little part of town. In fact, the place is over nine acres large and is a section of the Seattle Art Museum which I got to enter as well. Out in the park if your patient and wait you can enjoy free guided tours that give you a lot of information about the art. Or if you’re impatient like me, you spot the tour mid show and you just fall in line. After grabbing a quick bite to eat at a corner café like they do in the movies, (I had coffee for theatrical effect… I don’t even like coffee) I headed over to the Pike Place Market. Now this place was definitely the most crowded of places I visited while in Seattle. However when it comes to souvenirs there really is no better place to shop. Everything here is locally produced or funded. You can find everything from art to little knickknacks and of course, those odd ball foods. I didn’t spend much money here but I did walk around for a decent amount of time, often taking pictures of stuff that I would never put in my home, but just had to show my friends. You know, because the artists think that everyone needs a four foot tall stone angel wielding a sword in midflight as their homes centerpiece. Finally I got a little ways out of town and visited Discovery Park. Discovery Park is more beautiful than the pictures led me to believe. It’s this huge five hundred acre park with hiking trails crisscrossing and traveling all over the place. Without a map I surely would have gotten lost. If you’re an outdoorsy kind of fellow than this is the place for you. There are even beaches you can walk on, so it’s like a combination of every outdoor scenery you could imagine. Overall my stay in Seattle was great. I wish I had more time to spend at the Four Seasons Hotel but that could easily be remedied at a later date. Until next time my good friends.